Add Clayton Well’s modern Australian restaurant to your must-try list of lunch places this week. It has recently introduced a three-course menu comprising dishes that often change based on seasonal produce—in short a surprise. You can expect to feast on signatures such as the charred octopus tentacles beautifully dressed with fennel and ink sauce and red vinegar, and the grilled short rib presented simply with carrot kelp puree and dill pickled cucumber. We’re sure you’ll dig this too. When you dine with three other companions from now until April, you’ll get a complimentary cheese course from Mondays to Thursdays and a glass of sparking on Fridays. There’s no better feeling than indulging in delicious food without the hassle of counting your calories and now it’s possible with the help of culinary director David Senia and raw food chef Sandra Lim of Live Fruitfully. They’ve crafted an appetising five-course set composed of gluten-free and dairy-free creations, available from 3pm to 5pm on Fridays. 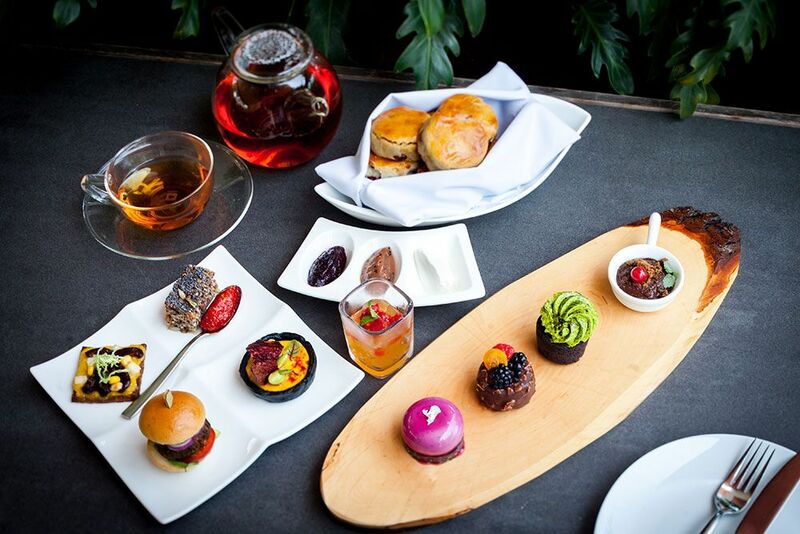 The signature scones at Chef's Table get a healthy twist with the raspberry-chia seed jam and whipped coconut cream, while the savouries remain drool-worthy—cauliflower crust pizza with shiitake "bacon" and portobello sliders with green goddess cream. The meal comes with your choice of Ronnefeldt Ayurvedic tea. Italian fare always tastes better with beer. This Wednesday (March 28), you’ll have both freeflow at Menabrea’s (Italy’s oldest brewery) and Latteria’s one-off dinner. Premium lager will flow from 7pm to 9pm and Franco Thedy, the fifth generation managing director of the family-owned brewery, will be there to take you through the beer’s rich history and more. Canapes will be served all night and it includes the popular buffalo milk mozzarella with tomato and basil and smoked salmon and stracciatella cheese crostini. Don’t miss this one night only special (March 27) where head chef Emanuele Faggi teams up with Perrier-Jouet’s cellar master Herve Deschamps to whip up tantalising Italian dishes paired with rare vintages. The night starts with a selection of canapes and Perrier-Jouet Grand Brut NV, followed by a parade of the kitchen's greatest hits: pan-seared white asparagus with deep-fried egg and sun-dried Sardinian grey mullet roe, and ‘Acquerello’ saffron risotto with bone marrow, topped with 24-karat gold leaf. "Demon chef"Alvin Leung of Bo Innovation in Hong Kong is coming to Singapore to cook up a storm with executive Chinese chef Liu Ching Hai. The eight-course, four-hands dinner, taking place from April 6 to 8, balances the former’s classic Cantonese style with the latter’s innovative approach. Both will be presenting their signatures. Chef Leung will be bringing his Bo chilli crab xiao long bao, drunken foie gras and jellyfish with Bo Sichuan green sauce; chef Hai will stick to his popular soups, which include the double-boiled soup with dried scallops, and the black cod in lotus root broth.